Located in Bedford, this sprawling 2,200 acre resort has been welcoming guests and making history for more than 200 years. Its red brick façade is distinguished by white columns, a porte cochere and a series of additions that amble their way up the hillside. The result is a charming combination of old and new elements that work in harmony against the rocky hills of south central Pennsylvania. The original mineral springs that drew the Native Americans, the early settlers and thousands who have sought respite for a multitude of ailments, have inspired the luxurious Springs Eternal Spa which offers a full range of health and beauty treatments. During the course of construction, a new spring was discovered, lying directly beneath the state-of-the-art spa. After a 20-year slumber and a $120 million restoration, this National Historic Landmark combines the legacy of its storied past with the modern amenities that distinguish today’s finest resorts. 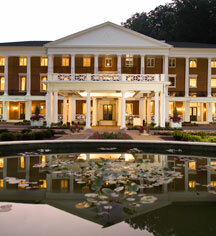 Click here to watch a video about Omni Bedford Springs Resort & Spa. 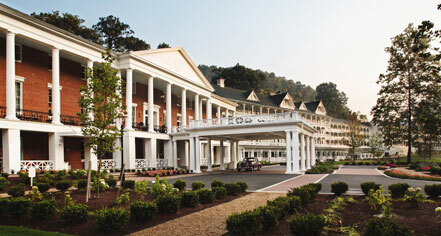 Omni Bedford Springs Resort & Spa, a member of Historic Hotels of America since 2008, dates back to 1806. The original glass in the windows of the Crystal Ballroom bear the inscriptions of brides who were married at the resort, dating back to the mid-19th century. Cancellation Policy: cancel 7 days prior to reservation without fee; cancellation fee is one night room stay. Deposit: A one night say deposit is required to secure a reservation. Early Check-In/Late Check-Out: Early Departure Policy: There will be a $50 charge for guests departing prior to their departure date. If a group or a pre-paid rate has a minimum night stay requirement, the remaining nights will be charged. Late Check-out Policy: Late check-out up to 2:00 p.m. may be available for a rate of $50. Hotel/Resort Fees & Taxes: A $39 + 8% applicable state and county taxes, per-room, per-day resort service charge will be added to the daily room rate. This resort charge allows guests to enjoy many resort services and activities without having to incur miscellaneous charges. Services include: in-room coffee and bottled water, morning newspaper delivery upon request, local and toll-free calls, in-room WiFi Internet Service, afternoon tea, business center privileges and valet parking. Occupancy Restrictions: No more than 5. Parking: Self-parking: Not Available. Valet parking: Included in Resort Fee. Payment: Cash-Paying Guests: Guests paying with cash must pay the full stay's room and tax, plus a $50 per day deposit is required for incidentals at check-in. Debit Card Policy: The use of a debit card will initiate, at the time of check-in, an immediate deduction from your bank account for your room rate, inclusive of tax, for all room nights plus $50 per night for incidentals. Upon check-out, any unused funds will be credited back to your account. Based upon the business rules of your bank, it may take 72 hours or longer for your bank to process this back to your account. Credit Card Policy: At check-in, there will be an authorization on your credit card in the amount of all room and tax plus $200 per night to cover any incidentals. Upon check-out, any unused funds will be credited back to your account. Based on the business rules of your bank, it may take 72 hours or longer for your bank to process this back to your account. Cards Accepted: MasterCard, Visa, Amex, Discover, and Diners Club. Pet Policy: Service animals allowed: Yes. Pets allowed: Yes. Amenities: Pet room service menu. Services: Rooms specifically designed with pets in mind. Pet-sitting. Restrictions: Maximum amount: 2 pet per room (more if preapproved). Fees: $150 (nonrefundable cleaning per stay per room); $175 if over 50 lbs. Other: Extreme or wild animals must be preapproved by General Manager. Rollaways: Available upon request, if space allows. Located in Bedford, this sprawling 2,200 acre resort has been welcoming guests and making history for more than 200 years. Its red brick façade is distinguished by white columns, a porte cochere and a series of additions that amble their way up the hillside. Learn more about the History of Omni Bedford Springs Resort & Spa .